This 7 3/8 " plate has a crisp image transfer printed in rich cherry red. 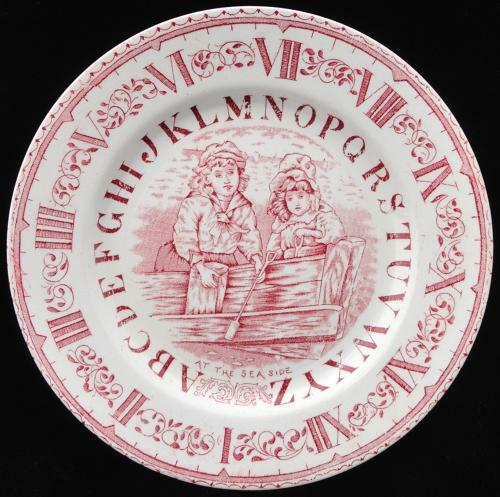 In addition to the entire ABC alphabet transfer, the plate features a clock face with the classic Brownhills decorative transfer for learning to tell time. The transfered image is of a young boy and girl with their sand shovels and pails ready for a romp at the sea side as sailboats pass by in the distance. Charming ! Condition is outstanding, clean shiny and bright. You won't find a better example in this pattern.